Thereafter 24th Vyasa was Valmiki. 1. Was this same Valmiki who wrote Ramayana? 2. Does 24th Vyasa means Vyasa from 24th Maha Yuga? 3. 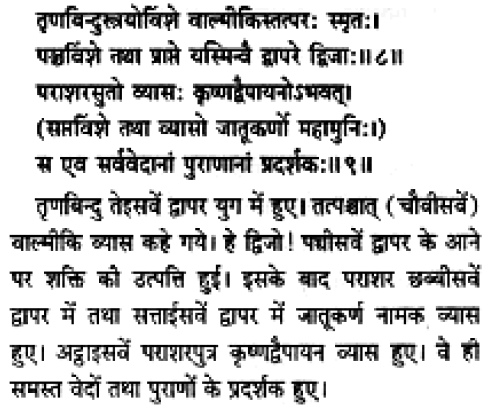 If answer of above two questions are Yes then is it true that there is no Kalpa Bheda in Rama's story from Vayu Purana and Rama incarnation happened in 24th Maha Yuga of current Kalpa->Manvanatra? 4. Does that also mean that Rama incarnation didn't happen again in 28th Maha Yuga as Vayu Purna mention next incarnations as Krishna Dvaipāyana? Yes. Vishnu Purana, Linga Purana (chapter 24) etc. mention names of Vyasa incarnations of different Maha yuga. There is Vyasa in every Dwapara yuga. Not the answer you're looking for? Browse other questions tagged ramayana rama vyasa valmiki . What's the story of Bhasmasura in which Lord Vishnu came as a Brahmin and Mohini?